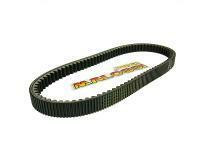 The Malossi Kevlar belt is a Kevlar reinforced belt for extreme demands.This belt is suitable for Kymco 4-stroke engines. Very good quality, as you expect from Malossi. Dimensions: 18,2 x 8 x 683 mm.